Congratulations to PA Ultimate 2020 defender Carolyn Thistlewaite! Thistlewaite has committed to study and play lacrosse at Colonial Athletic Conference powerhouse James Madison University. The defending 2018 NCAA champions, JMU is currently 8-3 and ranked #11 in the nation. “Carolyn is physical, aggressive and tough as nails. She is a great 1v1 and team defender that leads by example. Her work ethic is incredible and JMU is lucky to have her,” explained Ultimate Lacrosse Head Coach Michele DeJuliis. A two sport athlete from New Hope - Solebury High school, Thistlewaite is a key contributor to both her school’s field hockey and lacrosse teams. Part of a highly successful field hockey defensive unit, Thistlewaite and New Hope - Solebury only allowed one goal during the 2018 regular season. Thistlewaite and her field hockey teammates have made it to the state quarterfinals the last two years, winning their district each time. A field hockey Co-Captain in 2018, Thistlewaite was named to the First Team All-Bicentennial Athletic League. While Thistlewaite excels at field hockey, lacrosse is her true passion. She is the heart of whichever team she plays in, using her speed, patience, and versatility wherever her teammates need her on the field. A two-time First Team All-Bicentennial Athletic League player, Thistlewaite collected 46 ground balls and led the team in goals (59) in 2018. She also led the team in draw controls as a freshman. 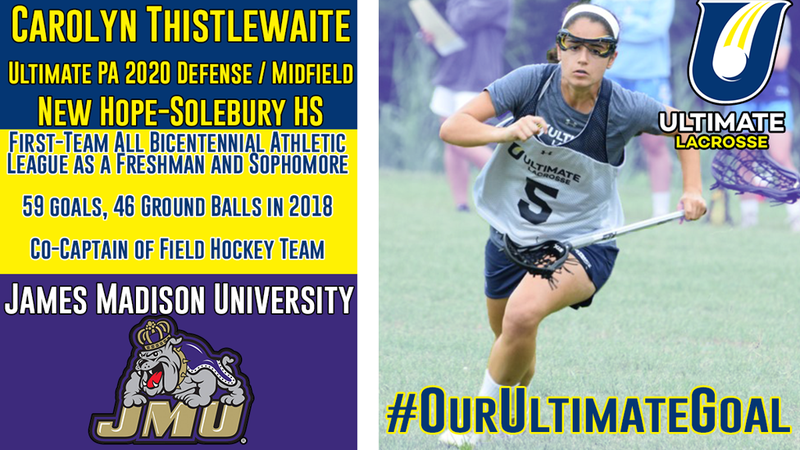 Outside of her success with Ultimate and New Hope - Solebury, Thistlewaite was also a part of the 2020 NJ WPLL Futures team and the US Lacrosse National Tournament Team Philly. Thistlewaite is also very involved in her community. She has coached youth lacrosse through Lady Bulldogs for the last 3 years and has coached youth field hockey for Doylestown Athletic Association for two years. Thistlewaite is a member of the Key Club and Future Business Leaders of America through New Hope - Solebury. “From my first trip to JMU for a clinic my freshman year I fell in love. It checked off everything that I wanted – great campus, great school atmosphere and strong academics. I have been so impressed with Coach Shelley, Coach Boissonneault and the whole JMU team. I love the team atmosphere – the way they all celebrate great plays on both offense and defense - and the gritty way that they play. They seem to work harder than any other team. I am excited for the opportunity to be a part of it,” explained Thistlewaite. The 2018 NCAA Championship winning Dukes are led by Head Coach Shelley Klaes-Bawcombe. During her 13 seasons at JMU Klaes-Bawcombe has a 151-75 overall record. After leading the Dukes to a program best 22-1 season, Head Coach Klaes-Bawcombe was named the 2018 NCAA Coach of the Year. 2014 Ultimate Lacrosse grad Elena Romesburg was a key part of JMU’s successful 2018 season, and we are excited to see how Thistlewaite will contribute to the Dukes!